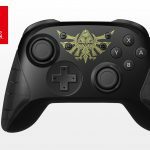 PowerA has announced a new Legend of Zelda addition to their Enhanced Wireless Controller lineup for the Nintendo Switch. Last year brought us the Twilight Princess-inspired Link Silhouette controller — a stylish, officially licensed alternative to Nintendo’s Pro Controller with a lower price point and additional features to make up for the lack of HD Rumble and amiibo support. The newest controller features Princess Zelda from Breath of the Wild set against a crisp white with tan accents. Aside from the artwork, the controller is identical to the rest of PowerA’s Enhanced controller lineup for the Switch. Two AA batteries will net you about 30 hours of playtime, and the back of the controller features extra, mappable buttons alongside the standard front and top layout. The only unfortunate thing about the controller I can find is an ill-placed speaker that gives Princess Zelda the illusion of getting a tracheotomy. But if you’re able to overlook this slight flaw you can preorder the controller right now for $49.99. The product is currently expected to ship around late April to early May, so the wait won’t be long!